Eighteen politicians have already announced their intentions to become President of the United States. Over the next seventeen months, as the candidates pave their roads to the White House, we can be sure to hear a score of immigration-related topics and proposals--just as we have heard an often-convoluted ranting about immigration in the national news these past couple of weeks. While many immigrants cannot vote, they can have a voice! The general election in November 2016 provides an important opportunity for organizing and movement-building, and we will be sharing resources and tools for engaging our immigrant communities. As we have in the past few national elections, NNIRR will roll out coverage of each candidate, their major proposals and remarks, and the overarching themes andpositions of each party. We've already started updating our election section of the website, and encourage you to visit it regularly for election news and information. Detention Watch Network has released a new video for the current Week of Action to End Detention, July 7-11. Voices from Detention shares the stories of women locked up at the Karnes Family Detention Center in Texas. Members of NNIRR's Board were able to meet with three women in Karnes a couple of weeks ago, and we won't soon forget their stories--similar to those in this video. Having fled Central America, the women had been arrested and detained upon crossing into the U.S., and have been in detention with their children for as long as eleven months, with bonds set at $7,500 to $10,000. The Karnes detention facility is one of many operated by the private prison corporation, The GEO Group. GEO and the Corrections Corporation of America (CCA) are targets of a nationwide divestment campaign coordinated through the National Private Prison Divestment Campaign. This last month, the Columbia University Board of Trustees voted to divest its endowment from investment in the prison industry, specifically, G4S, the largest global private security firm, and the U.S.-based CCA. A student-led campaign had organized from some 16 months on the issue, making Columbia the first university in the country to divest from the private prison industry. Click here for more information on the events being organized as part of the Week of Action to #EndDetention. The issue of migrant deaths and the problem of unidentified migrant remains is generating greater national interest. 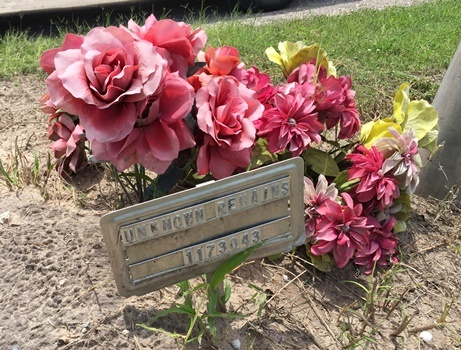 The Texas Observer revealed in a lengthy investigative article earlier this month by John Carlos Frey,"Graves of Shame," that unknown numbers of human remains, believed to be migrants, lay buried in cemetaries throughout south Texas. NNIRR board members visited one such burial site a couple of weeks ago with Board chair Eddie Canales, director of the South Texas Human Rights Center in Falfurrias. The unidentified remains are often buried together in mass graves. Missing autopsy reports, overbilling from funeral services, failure to properly mark graves are just a few of the many problems that continue to surface. University forensic anthropologists have been helping to exhume some of the graves in order to provide proper identification and reburial, with notification of anxious and grieving families. Migrant rights advocates in Texas are demanding accountability from the state's Governor Gregg Abbott and Attorney General Ken Paxton. They are asking for further investigation into wrongdoing concerning the recovery, identification and burial practices of unidentifying human remains. A letter going to Gov. Abbott states that, "Mass graves should be unlawful, and those who unceremoniously discard human remains in unmarked graves shoud be held accountable." In the meantime, families continue to contact local organizations for information on loved ones who had intended to cross the border, only to have simply disappeared. Even while Donald Trump's business associates were distancing themselves from him this past week following his racist rant against immigrant, he seized on news of the fatal shooting of a young woman in San Francisco. The alleged shooter? An undocumented immigrant, Francisco Sanchez, who had been deported five times. While ICE had made a "detainer" request, he had been previously released by the San Francisco sheriff's department in line with the city and county's sanctuary policy. The incident has become a renewed focal point for attacks on similar policies around the country that have sought to disentangle local policing from immigration enforcement. Angela Chan from Advancing Justice-Asian Law Caucus in San Francisco recently debated the issue is this KQED radio broadcast. Listen here. There will certainly be more to come on this issue. Today, the 5th Circuit Court of Appeals is hearing oral arguments in an appeal to the lawsuit against President Obama's executive action, as immigrant community and rights supporters have gathered outside the courthouse in New Orleans. Essentially, the appeal is seeking approval for the programs to go forward. However, as two of the judges hearing the appeal are the same ones who denied an appeal against a "hold" on the program, and the 5th Circuit is believed to be one of the most conservative courts in the country, not much hope is held that the appeal will be successful. Experts believe the case could go to the Supreme Court, with a ruling as late as June of next year, just months before the end of the Obama presidency. Read the latest from The Hill here.